Have your own fabric? No problem! 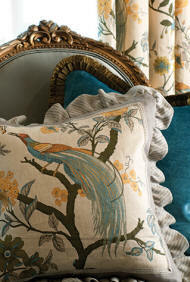 We can custom-make any Drapery Treatment from your fabric. 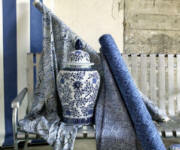 How Do We Begin The Custom Drapery Process? We begin with our in-home consultation with Susan Meaken who has 26 years of experience helping you to choose a fabric and stile to best fit your decorating needs. She will then Measure and price the window treatments you have selected. Your treatments are then installed using the highest quality hardware by a professional Designing Windows Plus installer. Trim and Decorative Hardware can also be added to enhance your drapery top treatment or shade. Cornice Board - We have a wide selection of shapes to choose from. All wood construction which is padded and upholstered. 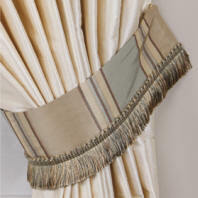 Box Pleat Valances - Can be either scalloped or straight. We can even add a crown molding, if you choose. 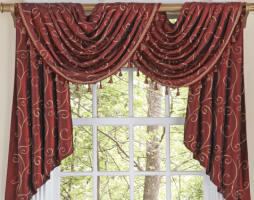 Swag Valances - Some have cascades and jabots. In most cases swag valances are mounted on a decorative pole or board-mounted. Empire style swags are also an option. 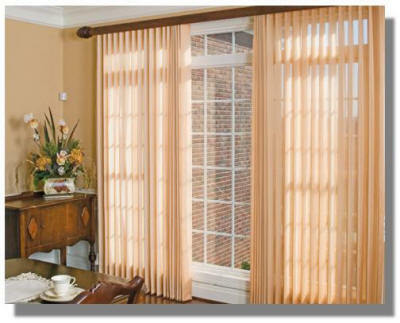 Swags and their components make beautiful top treatments whether used alone or to top other window treatments. 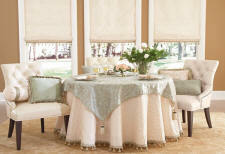 These window treatments are made to be raised and lowered or to stay stationary as a topper. Finally, we also offer Bedcovering and a Fashion Accessory Program. This includes bedspreads, comforters, coverlets and duvets. To enhance a bedroom add a custom dust ruffle, throw pillows, pillow shams, headboard, or table covers from our many fabrics. We can also make custom shower curtains.